There is something immensely satisfying about seeing a play like Interrogation: Lives and Trials of the Kamloops Kid (playing at the Factory Theatre Mainspace as part of the Toronto Fringe Festival) on Canada Day. With a story that engages important issues like citizenship, identity, colonialism and war, Interrogation is an ambitious, thoughtful production that just needs a little more polishing. Interrogation: Lives and Trials of the Kamloops Kid is a dramatization of fictitious letters exchanged between the very real Kanao Inouye (a relative of co-playwright, Karri Yano), a Japanese-Canadian working in Japan who is later conscripted into the Japanese army during World War II, and his sister, Martha, who is facing increasingly hostile racism at home and life in the Japanese internment camps in Canada. While I am familiar with this darker side of Canadian history, I learned a great deal more from this two-hander. The playwrights, Yano and Evan Mackay, have a good eye for details and, as an Asian-Canadian myself, I identify with many of the characters’ difficulties navigating between two cultures. At one point, Kanao has a fantastic monologue that illustrates how something as mundane as eating an apple can be interpreted vastly differently between two cultures. The horrific conditions of the Japanese Canadian internment camps were similarly brought to life by Martha’s vivid descriptions of her barren surroundings. While, the writing was very strong during more emotional moments, some of the earlier monologues sounded too exposition-heavy and non-descript. I also thought the play could be tightened up in certain places while I desperately wanted to hear more at other times (such as the transition of Kanao into soldierhood). I have to commended the actors for keeping their focus throughout despite multiple cell phone rings. Even though I felt the performances lacked energy at the start of the show, Benaldo Yeung and Loretta Yu were perfectly heart-wrenching in the latter half. I also wished there were more moments involving both characters because the brief scene where their responses overlapped gave us a taste of the fantastic chemistry between the two actors. During certain moments, I got the sense that this production was developed with a smaller venue in mind: I had trouble hearing the actors at times and the blocking often did not extend beyond centre stage. Although I enjoyed the projections of historical photos – a tangible reminder that the recounting of the hardships faced by the characters are grounded in history – the numerous slide changes sometimes distracted me from the performances. There were also times when projection and lighting cues were late. However, despite the weaker technical aspects, I was still extremely glad to have seen a show like Interrogation at Fringe. With recent events like the establishment of Bill C-24, I think it is tremendously important for companies like Collidescope to bring a diversity of stories to Canadian theatre canon. And, as always, it is nice to see some much-needed colour on our stages. With a company this talented and a story this important, I just think that Interrogation: Lives and Trials of the Kamloops Kid can push farther. This performance is not accessible for non-English speakers. 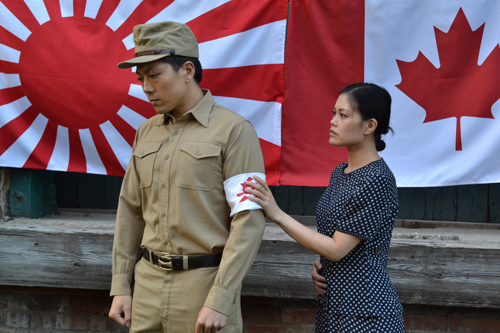 Photo of Benaldo Yeung and Loretta Yu by Jessica Dix.